WASHINGTON, D.C.-- In cooperation with U.S. Consumer Product Safety Commission, Carolina Enterprises, Inc., Tarboro, North Carolina, today announced a voluntary replacement program affecting approximately 100,000 of its Super Slide Item #9005. The ladder with this Supper Slide presents a potential safety hazard in that the heads of small children may become entrapped between the ladder rungs. The Commission is aware of one instance in which a child's head became entrapped between the top step of the ladder and the platform. No injury occurred as a result of this incident. The Supper Slide consists of a plastic red sliding board with a yellow ladder and comes unassembled. The name "Empire" appears at the foot of the sliding bord. Ladders which have been manufactured since June, 1982, are not subject to replacement. These redesigned ladders can be identified by the pre-formed plastic piece attached to the underside of each ladder rung. The new slides are now blue in color. The Super Slide wassold by numerous retail stores nationwide including Toy "R" Us, K Mart, Woolworth/Woolco, and by J.C. Penney Company in its catalogue. J.C. Penny Company, which was able to identify individual purchasers, has already notified its customers by direct mail and has completed the replacement program. 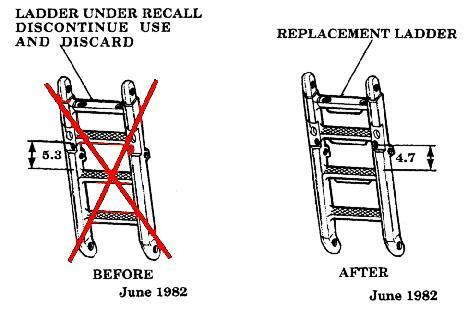 The units being recalled sold for approximately $30.00 and were produced from 1980 until June, 1982, when the design change was made in the ladder. 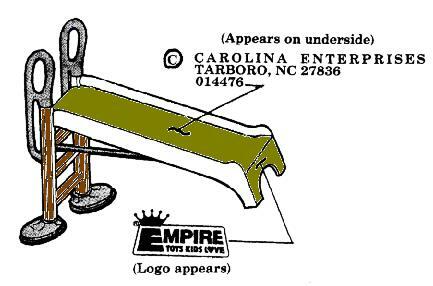 Consumers owning affected slides should discontinue use of the ladder and call Empire toll-free at 800-334-5666 for a free replacement ladder or write to Carolina Enterprises, P.O. Box 427, Tarboro, North Carolina 27866. This replacement program also applies to consumers who purchased affected products at Woolco stores which have since gone out of business. Carolina plans to send notices to all of its retail customers seeking their assistance in placing posters in stores, providing a list of consumers who purchased the slide and any other help they can provide in replacing as many of these ladders as possible. Further information on the ladder replacement program can be obtained by calling the Commission's toll-free Hotline at 800-638-CPSC. The teletypewriter number for the hearing impaired is 800-638-8270.